My main planner… the most used book in my daily book bag. It not only has room for lessons, but meal plans, book list, monthly budget planning and field trip and activity planning. 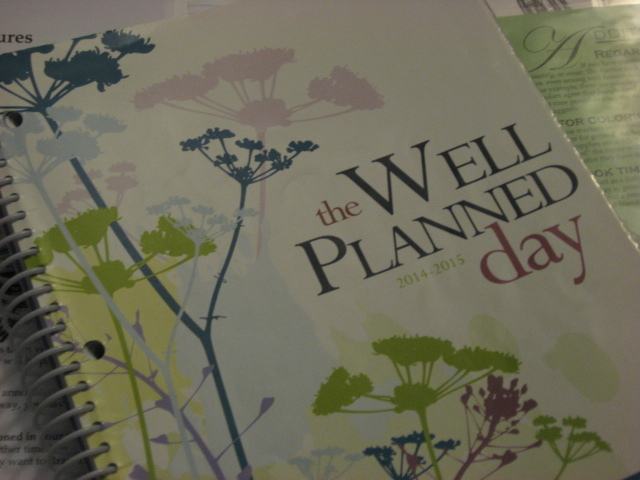 It’s a homeschool planner, but it’s also a life-planner… The Well Planned Day by Home Educating Family Publishing. Each year I choose between my said planner and another one I really like called The Ultimate Homeschool Planner by Debra Bell. 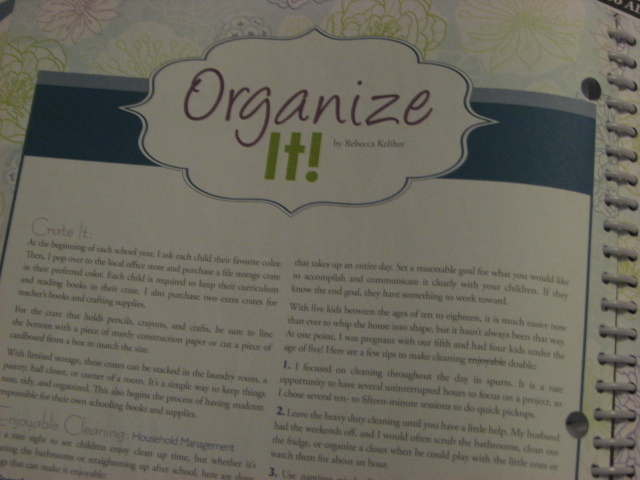 Both have everything I need and more, including articles, homeschool teaching and planning tips. 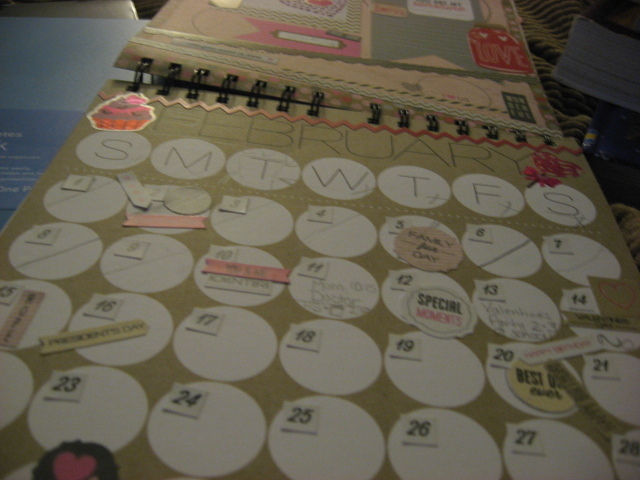 My current planner, The Well Planned Day is dated and The Ultimate Homeschool Planner is not dated. So dependending on whether or not we homeschool year-round. Hey, when you get bit by the cancer bug, or interstitial cystitis (it’s a real word, promise), homeschooling takes a backseat for a few weeks while mom feels like garbage… hence, homeschool through summer, but take a few weeks off during the official school year. 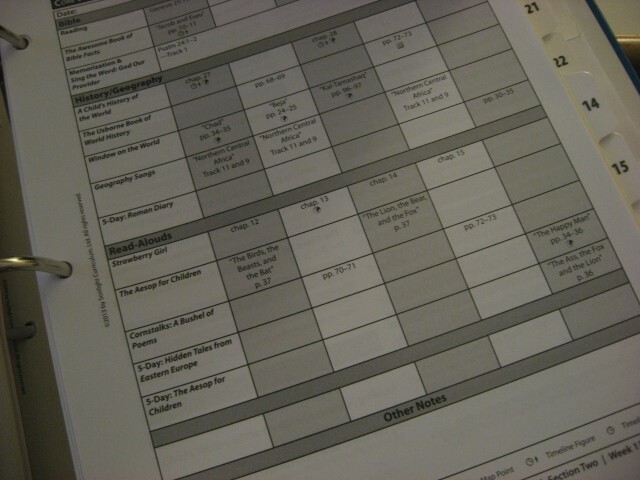 The planners hold the bare bones schedule. They are basically where all the Instructor’s Guides meet in one place. 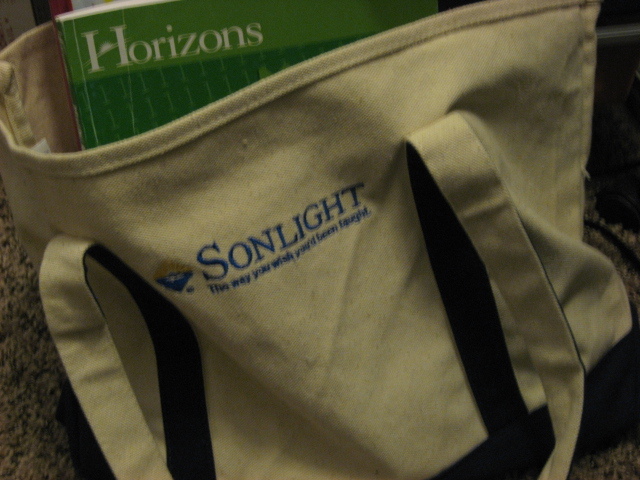 We use and love Sonlight with supplements for Math and Language Arts/Reading so I have a great big schedule in the Sonlight guide and several small schedules from other programs. When the days get too busy, I feel sick, or problems or blessings arise that encourage us to finish school a little quicker than planned, I don’t read through my Sonlight guide, and the other little guides, not to mention all the notes that go along with them. Rather I peek in my master planner, which basically holds the name of the book name and page numbers. Sonlight’s grid-style planner, with pages of laid out lesson plans and extra activities for each week directly behind it are the easiest system I have used so far. We are literature based-learning homeschoolers and I have found SL to be the richest reading based curriculum I have used. And the math programs are the most complete I have found in any company, as they use Mathtacular along with Teaching Textbooks and Create-a-Calender with 1st grade Horizons. I set up the massive binder pretty much the way it’s recommended… History, which includes Bible, read-alouds, poetry, geography, and music. Then I have Sonlight Science behind that which is set up the same way… a grid style plan for each week followed by notes and expanded lesson plans in the pages to follow. Then we have Sonlight Laguage Arts and Readers, with the activity sheets and copywork lessons. I like to use Sonlight’s reading schedule for Kindergarten through third grade. Sometimes I will use the scheduled copywork that fits nicely with the reading. I don’t particularly like their activity sheets (which sometimes use the copywork as a base for the activity.) It seems a little disconnected. While I do see the overall value of using it year after year, my boys just can’t remember grammar concepts when taught this way. I also don’t use the “word list” lessons since we are still doing phonics using Explode the Code. I use each ETC lesson’s word list like a spelling list and create extra activities using these words. Some of the words make into our dictionary- a homemade notebook with 2 pages for each letter. Vocabulary words from Sonlight history and science go into the dictionary as well. The rest of the notebook is used for copywork. It’s completely written for and by my son. Again, 2 pages per letter for vocab and some spelling; the rest of the book is for any copywork assigned. It is essential to our education goals that my boys read and write every single day. If creative writing is not assigned, then we use copywork. Where does the copywork come from? Well, sometimes Sonlight Language Arts and memory verses are enough. Other times we use my supplementary Language Arts… First Language Lessons for the Well Trained Mind and Winning With Writing. I have use FLL since my oldest was in first grade. It is an extremely gentle, yet effective method for learning language arts. We use Mc Ruffy Modern Handwriting, only when he needs extra practice with a letter. The handwriting workbook has copywork built into it so this is my go-to book when we need to car-school. Because Mom (me) is a writer I like to make writing fun for the boys. I found that working backwards in the writing process is how I write best, so I allow them to do the same… free-writing, then creating a draft or outlining, corrections, then final draft. The daily writing, when it’s not copywork, but is creative writing, is the most fun part of our curriculum. Probably because I designed it myself. I’ve been working on it for almost 7 years and have pulled what I like best from writing curriculum written by my favorite teachers. Toot, toot. We use Horizons Math, but will be switching to Teaching Textbooks and MathTacular in 3rd grade. It’s what I began using with my oldest and works well since I love math, but am not a very good math teacher. We take math seriously in our home. It is very important that my kids grow to have strong math skills. Just as important as reading. I think math makes the difference between a mediocre education and a solid one… Math is just as important as reading and writing, although some programs don’t seem to agree and their curriculum reflects it… Math is just as important as reading and writing folks. Finally, the little Well Planned Day boxes can’t hold all of our plans. The Sonlight boxes are great, but I need a notebook that I can take a look at, keep on my clipboard or kitchen counter, and be able to pull our activities, verses, copywork, page numbers, enrichment, review, and reminders. That’s where the spiral notebooks come in handy. And since spiral notebooks tend to be really cheap in quality, I go to Target and buy yoobi brand. They are excellent, big and sturdy. So, that’s what we do right now and it works well. Lesson planning, including writing it all down in the yoobi notebook takes about an hour a week. It’s all recorded, planned and set to go for any official who dares to peek at my program! 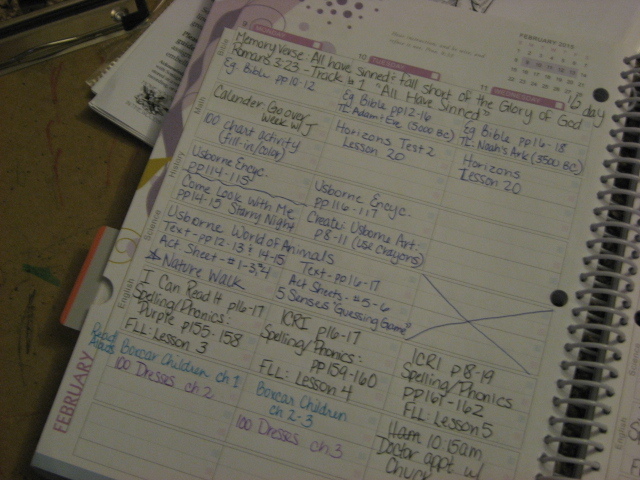 Organization and planning is the most important job as a teacher. As a homeschool mom it’s attention and guidance as well as teaching. When I lived in Gainesville Florida I became friendly with the leader of our hs group. Shortly before we moved she lost one of her children and it seemed to bring us closer as I was able to relate to some of the struggles her son went through. Later as I was reading Mary Pride’s great big book of homeschooling I noticed that she wrote a chapter in the book! I was more than impressed with the humbleness with which this woman carried herself. One of the many pearls of wisdom this woman passed down to me was that I needed to become organized and remain organized. If I find my homeschool and household disorganized I should take a week off and ORGANIZE. It was one of the best pieces if advice I learned from her. That’s why I began my post about curriculum and ended it also, with panning. I hope you enjoyed reading about our homeschool books and guides. I sure did have fun choosing them! I love to read posts about what others do for their homeschool so please link me to your blog if you too have shared what you do with your budding future presidents. Thanks friends. Have a wonderful afternoon. This entry was posted in homeschool, Organizing and tagged First Language Lasson, homeschool, reading, Sonight, Well PLanned Day. Bookmark the permalink. ← Aromatherapy 101, 102, and 103! Thanks for sharing! [smile] I love how we can tweak our homeschooling to fit our family’s needs so we can focus on the pieces that work.